Introverted sensing (or Si for short) is one of the most misunderstood cognitive functions in the personality community. Many people make assumptions about Si-users as being overly-traditional or rule-following to a fault. So today I want to talk about what it REALLY feels like to have introverted sensing in your function stack. Si is the dominant function of ISJ personality types and the auxiliary function of ESJ personality types. INPs use Si in the tertiary position and ENPs use Si in the inferior position and may suppress it. In my experience as an MBTI® practitioner I’ve seen many Si-users mistype as Ni-users because of poorly worded tests. 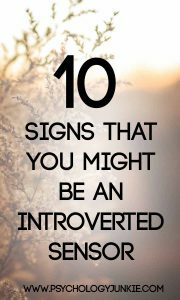 If you’re unsure about whether you use Si or Ni you can read this article and then read 10 Signs That You Might Be an Introverted Intuitive to see which function suits you better. Do you relate to these signs of introverted sensing? What is your experience? Share your thoughts with us in the comments!